Boss Dean Austin says he has given the Cobblers players ‘the freedom to go and express themselves’ - and it seems to be paying dividends. After a run of 10 matches without a win and the sacking of manager Jimmy Floyd Hasselbaink, the Cobblers have breathed life into their Sky Bet League One campaign with back-to-back victories over Bury and Plymouth Argyle. Those six points gained, coupled with Town’s rivals’ poor form and failure to make the most of games in hand, mean that Austin’s men have a realistic chance of league one survival, something that looked a lost cause just a fortnight ago. The Cobblers travel to relegation rivals Walsall on Saturday (ko 3pm) knowing a win will take them above the Saddlers, and could even see them out of the bottom four if other results were to go their way. So what has been behind the transformation in form? Austin says it is simply down to raising confidence, getting the players to believe in each other again, and to believe in their own ability, suggesting part of the reason for that damaging 10-match run without a win was down to the players simply caring too much. “I actually think that in the four or five games before we got this run going, we have had too many players that are trying too hard,” said Austin. “Then what ends up happenning is players start coming out of their slots, out of their positions, and are trying to make up for mistakes of their team-mates or whatever. “They are over trying, and they then end up getting picked off themselves and are not being in the areas they need to be, and then we end up conceding goals or whatever and it looks really bad. “One of the things we have spoken about is having the confidence in each other. “The confidence to make sure know your own team-mate is going to do his job, we’re moving as a team, we’re in the spaces we need to be in, so that when we get the ball ourselves we can then go and play and express ourselves. One of the main beneficiaries of Austin’s change in the Town mindset has been midfielder Matt Grimes. The Swansea City loan man has been a virtual ever-present for the Cobblers this season and has enjoyed some good games, but as the team has struggled for much of the campaign, so has he. But the England Under-21 international, who cost the Swans close to £2million when they bought him from Exeter City, possesses undoubted quality, which he has shown in the past two games. 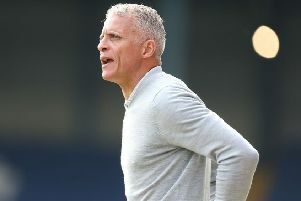 Grimes has been outstanding in the wins over Bury and Plymouth Argyle, and will be a key man at Walsall again this weekend, and Austin believes that upturn is down to the fact that the player is now happier and more relaxed after being told to ‘enjoy yourself’. “It is very hard because of the moment the team has been in, and Grimo is an exceptional player,” said Austin. “For me, he is better than this level, and I think we have three or four in this team that are probably better than the level. “But sometimes the way the team is performing or the things the team is being asked to do might not suit the players you have in your team. “Add that to the way the opposition play, and whay they are doing, and then (as a player) you can worry more about what the opposition are doing rather than what you are doing yourself and trying to impose yourself and your game on the other team. “With Grimo, I have said to him ‘listen, you need to go and enjoy yourself mate, you need to enjoy your football’.